For dragon boating as a sport, see dragon boat. The Tuen Ng or Duanwu Festival, also often known, especially in the West , as the Dragon Boat Festival, is a traditional holiday originating in China, occurring near the summer solstice. It is also known as Zhongxiao Festival (Chinese: 忠孝節; pinyin: Zhōngxiàojié), commemorating fealty and filial piety. The festival now occurs on the 5th day of the 5th month of the traditional Chinese calendar, which is the source of the festival's alternative name, the Double Fifth Festival. The Chinese calendar is lunisolar, so the date of the festival varies from year to year on the Gregorian calendar. In 2014, it fell on June 2; in 2015, on June 20; and in 2016, it occurred on June 9. The usual English name for the holiday, "Dragon Boat Festival," directly translates into two alternative Chinese names for the holiday, Lóngchuánjié and Lóngzhōujié. The official Chinese name of the festival is 端午节 on the mainland and 端午節 in Taiwan, Hong Kong, Singapore and Macao. This is pronounced variously in different Chinese languages. In Mandarin, it is romanized as Duānwǔjié on the mainland and Taiwan; in Cantonese, it is romanized as Tuen1 Ng5 Jit3 on Hong Kong and Tung1 Ng5 Jit3 on Macao. All of these names (lit. "Opening the Seventh") refer to its original position as the first seventh-day (午日, Wǔrì) in the fifth month (五月, Wǔyuè) of the traditional Chinese calendar, which was also known as 午 (Wǔ). Both the People's Republic and the Republic of China use "Dragon Boat Festival" as the official English translation of the holiday, while Hong Kong calls it the "Tuen Ng Festival" and Macao calls it "Dragon Boat Festival (Tun Ng)" in English and Festividade do Barco-Dragão (Tung Ng) in Portuguese. Among Malaysian, Singaporean, and Taiwanese Hokkien speakers, the festival is also known as the "Fifth Month Festival," the "Fifth Day Festival," and the "Dumpling Festival." In Indonesian, the festival is known as "Peh Cun", which is derived from Hokkien (扒船; pê-chûn). 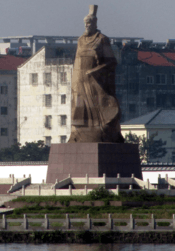 A statue of Qu Yuan in Jingzhou, at the site of the former Chu capital Ying. The story best known in modern China holds that the festival commemorates the death of the poet and minister Qu Yuan (c. 340–278 BC) of the ancient state of Chu during the Warring States period of the Zhou Dynasty. A cadet member of the Chu royal house, Qu served in high offices. However, when the king decided to ally with the increasingly powerful state of Qin, Qu was banished for opposing the alliance and even accused of treason. During his exile, Qu Yuan wrote a great deal of poetry. Twenty-eight years later, Qin captured Ying, the Chu capital. In despair, Qu Yuan committed suicide by drowning himself in the Miluo River. It is said that the local people, who admired him, raced out in their boats to save him or at least retrieve his body. This is said to have been the origin of dragon boat races. When his body could not be found, they dropped balls of sticky rice into the river so that the fish would eat them instead of Qu Yuan's body. This is said to be the origin of zongzi. Despite the modern popularity of the Qu Yuan origin theory, in the former territory of the state of Wu, the festival commemorated Wu Zixu (died 484 BC). Wu Zixu was the Premier. Xishi, a beautiful woman sent from king Goujian of the state of Yue, was much loved by king Fuchai. Wu Zixu, seeing the dangerous plot of Goujian, warned king Fuchai, who became angry at this remark. 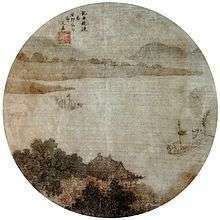 Wu Zixu was forced to commit suicide by king Fuchai, with his body thrown into the river on the fifth day of the fifth month. After his death, in places such as Suzhou, Wu Zixu is remembered during the Duanwu Festival to this day. The front of the Cao E Temple, facing east, toward Cao'e River, in Shangyu, Zhejiang, China. Although Wu Zixu is commemorated in southeast Jiangsu and Qu Yuan elsewhere in China, much of Northeastern Zhejiang including the cities of Shaoxing, Ningbo and Zhoushan celebrates the memory of the young girl Cao E (曹娥, AD 130–143) instead. Cao E's father Cao Xu (曹盱) was a shaman who presided over local ceremonies at Shangyu. In 143, while presiding over a ceremony commemorating Wu Zixu during the Duanwu Festival, Cao Xu accidentally fell into the Shun River. Cao E, in an act of filial piety, decided to find her father in the river, searching for 3 days trying to find him. After five days, she and her father were both found dead in the river from drowning. Eight years later, in 151, a temple was built in Shangyu dedicated to the memory of Cao E and her sacrifice for filial piety. The Shun River was renamed Cao'e River in her honour. Another suggestion is that the festival celebrates a widespread feature of east Asian agrarian societies: the harvest of winter wheat. Offerings were regularly made to deities and spirits at such times: in the ancient Yue, dragon kings; in the ancient Chu, Qu Yuan; in the ancient Wu, Wu Zixu (as a river god); in ancient Korea, mountain gods (see Dano). As interactions between different regions increased, these similar festivals eventually merged into one holiday. Hari in Tomigusuku, Okinawa, Japan. The festival was long marked as a cultural festival in China and is a public holiday in Hong Kong, Taiwan and Macau. The People's Republic of China government established in 1949, however, did not officially recognize Duanwu as a public holiday. Beginning in 2005, the government began to plan for the recognition of three traditional holidays, including Duanwu. Since 2008, Duanwu has been celebrated not only as a festival but also as a public holiday in the People's Republic of China. It is unofficially observed by the Chinese communities of southeast Asia, including Singapore and Malaysia. Equivalent and related official festivals include the Children's Day in Japan, Dano in Korea, and Tết Đoan Ngọ in Vietnam. In Japan's Okinawa Prefecture, they continue to have a tradition of dragon-boat races known as hārī (爬竜). In the capital city of Naha, the Naha Hārī (那覇ハーリー) is performed as part of the national observance of Children's Day, but in Itoman the Itoman Hārē (糸満ハーレー) is celebrated the same day as the Duwanwu Festival in the Chinese lunar calendar. The city of Tomigusuku also has its own Tomigusuku Hārī (豊見城ハーリー) but it is performed in late July. A dragon boat racing in San Francisco, 2008. Three of the most widespread activities conducted during the Duanwu Festival are eating (and preparing) zongzi, drinking realgar wine, and racing dragon boats. Other common activities include hanging up icons of Zhong Kui (a mythic guardian figure), hanging mugwort and calamus, taking long walks, and wearing perfumed medicine bags. Other traditional activities include a game of making an egg stand at noon (this "game" implies that if someone succeeds in making the egg stand at exactly 12:00 noon, that person will receive luck for the next year), and writing spells. All of these activities, together with the drinking of realgar wine, were regarded by the ancients as effective in preventing disease or evil, while promoting health and well-being. In the early years of the Republic of China, Duanwu was celebrated as the "Poets' Day" due to Qu Yuan's status as China's first known poet. The Taiwanese also sometimes conflate the spring practice of egg-balancing with Duanwu. The sun is considered to be at its strongest around the time of summer solstice, as the daylight in the northern hemisphere is the longest. The sun, like the Chinese dragon, traditionally represents masculine energy, whereas the moon, like the phoenix, traditionally represents feminine energy. The summer solstice is considered the annual peak of male energy while the winter solstice, the longest night of the year, represents the annual peak of feminine energy. The masculine image of the dragon was thus associated with the Dragon Boat Festival. 1 2 Chinese Government's Official Web Portal. "Holidays". 2012. Accessed 1 November 2013. 1 2 Ministry of Foreign Affairs, Republic of China (Taiwan). "Holidays and Festivals in Taiwan". Accessed 3 November 2013. 1 2 Macau Government Tourist Office. "Calendar of Events". 2013. Accessed 3 November 2013. 1 2 3 GovHK. " General holidays for 2014". 2013. Accessed 1 November 2013. ↑ "Double Fifth (Dragon Boat) Festival". 1 2 3 SCMP." Earthquake and floods make for muted festival. Retrieved on 2008-06-09. Archived June 25, 2012, at the Wayback Machine. ↑ People's Daily. "Peopledaily." China to revive traditional festivals to boost traditional culture. Retrieved on 2008-06-09. ↑ Xinhua Net. "First day-off for China's Dragon Boat Festival helps revive tradition." Xinhua News Agency. Published 2008-06-08. Retrieved on 2008-06-09. ↑ "Dragon Boat Festival". China Internet Information Center. Retrieved on 2013-06-12. ↑ Huang, Ottavia. Hmmm, This Is What I Think: "Dragon Boat Festival: Time to Balance an Egg". 24 June 2012. Accessed 3 November 2013. ↑ Chan, Arlene & al. Paddles Up! Dragon Boat Racing in Canada, p. 27. Dundurn Press Ltd., 2009. ISBN 978-1-55488-395-0. Accessed 1 June 2011.